What's a tentacle? Am I upstairs? I got lost. 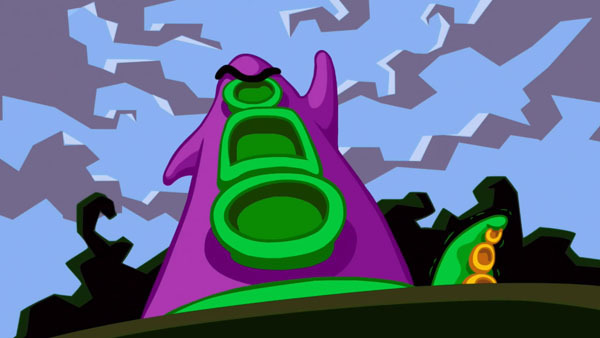 It's been a long time coming (my entire life, actually) but Day of the Tentacle Remastered finally has a set release date, and it's coming out for PlayStation 4, PS Vita, and PC in March 2016. That's totally only a few months away and I'm actually freaking out right now. The debut trailer above and the premiere date were shown off during PlayStation Experience 2015 amongst the deluge of information on the upcoming titles in the PlayStation roster. It's going to feature updated graphics, audio, and more, but most importantly it's going to provide a way to play one of the best LucasArts adventure games of all time on the PS Vita, which is a great place for all the SCUMM games, incidentally. Unfortunately, there won't be a physical release this time around, which is a huge bummer. I'm pretty tired of decent games getting the slip and only releasing digitally while lesser titles get pushed out the door onto discs lickety-split, but that's another story entirely. I'm still gonna buy Day of the Tentacle Remastered, duh.